That trusted product you've relied on for decades is now armed with an innovative extended applicator that helps you lubricate tricky spots quickly and easily. It’s nothing new. The problem is familiar to anyone whose projects often involve WD-40® Multi-Use Product. In the course of its decades-long history, the penetrating oil and lubricant has earned its place as a toolbox staple, but in tight spots—beneath the sink, for example, or within a lawn-mower engine—it’s not always easy getting the formula precisely where you want it to go. Most of the time, the stiff, stubby red straw applicator does the job just fine. Now and again, though, its rigidity slows you down. But not anymore. 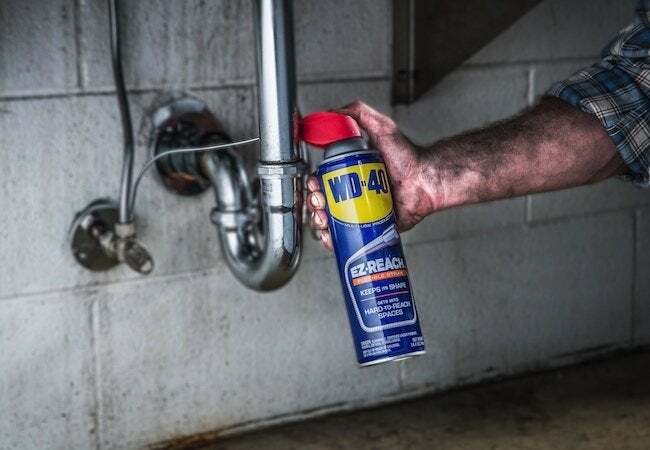 In a clever, innovative solution to a longtime source of frustration, the new WD-40 EZ-REACH™ delivers the same product you’ve always depended on, but substitutes the traditional straw for an eight-inch-long, flexible metal hose. Bend it however you like, and the hose holds its shape until you bend it into a new one. Now, you can easily and accurately reach the nooks and crannies that used to be virtually unreachable, and you can speed through steps that used to take you far too much effort and time. It’s a welcome upgrade, largely because tight spots, close quarters, and lack of access characterize so many of the scenarios where you’d typically use the product. Take, for example, household plumbing: Systems are designed to stay out of the way, hidden behind walls and inside cabinets. To make repairs, you need to get on your knees, on your back, or on tiptoe. It’s never easy, but with WD-40 EZ-REACH™ and its bendable applicator, those tricky jobs don’t have to be so utterly taxing. Imagine that you need to lubricate the upper hinge of a tall entry door. In the past, you would have had to travel all the way to the truck or garage, haul out the ladder, and spend at least a few moments setting it up safely. Armed with WD-40 EZ-REACH™, the same fixes that used to take several minutes can be done in seconds flat. To get to that top hinge, you’d simply bend the metal hose into a downward-pointing U shape, extend your arm overhead, and press the trigger on the can. That’s it! You’re ready to move on. Cleanup, too, becomes a breeze. It used to be that pros and do-it-yourselfers would apply WD-40 liberally, spraying the formula all over the general area, hoping that at least some would land on the problem spot. Does that sound familiar? And afterward, you probably went back to wipe up the overspray. This is certainly not the most efficient process. Thanks to WD-40 EZ-REACH™ and the accuracy it provides, you can skip the cleanup altogether and put your valuable time to much better use. An added bonus: Because the new design enables you to apply the right amount of WD-40 exactly where you need it, you’ll no longer be tempted to use more of the formula than is strictly necessary for the task at hand. 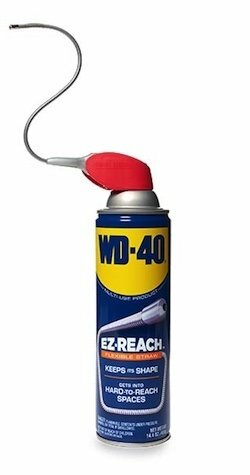 In other words, WD-40 EZ-REACH™ eliminates waste, which means that a single can will probably last longer than ever before, so you may be able to go longer between replacements. Over time, those costs really add up, making WD-40 EZ-REACH™ a first choice not only for ease of use, but for savings as well. 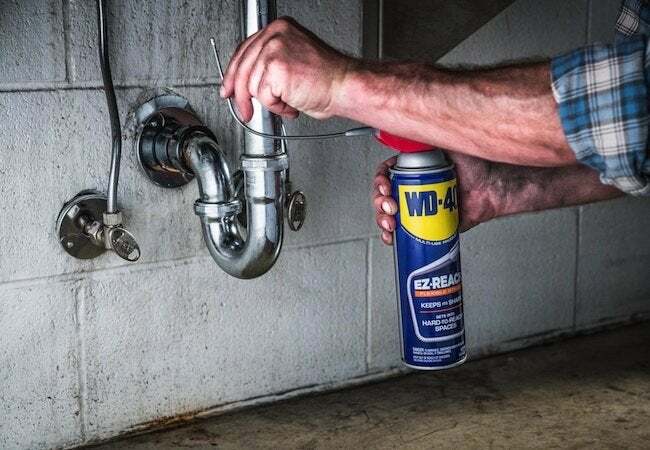 In the end, WD-40 EZ-REACH™ delivers on a simple promise to all those who have made the product a household name by relying on it, whether on the job or around the house, for more than six decades. You get the same formula you know and love—the one that has proven itself indispensable time and time again—only now, it’s better than ever, allowing you to reach the formerly unreachable. The stiff, red straw could take you only so far, but with the new flexible hose, there’s no limit on where you can go. This post has been brought to you by WD-40®. Its facts and opinions are those of BobVila.com.